“The Hidden Halls of Hazakor” is a kickstarter for an upcoming fifth edition Dungeons & Dragons adventure designed with the beginning Gamemaster in mind. It is written by Scott Fitzgerald Gray with illustrations by Jackie Musto. You can find the kickstarter HERE. Scott Fitzgerald Gray is a writer, game designer and editor whose credits include adventures and core books for the last three editions of Dungeons & Dragons. He was co-editor of the fifth edition Dungeon Master’s Guide and Monster Manual, and has written numerous adventures. Jackie Musto is an artist and illustrator, who created the Kay and P Comic series. She also created the Adventures of Lady Skylark and has worked as an illustrator on a variety of projects, including RPGs. I was able to speak with both of them about their kickstarter for “The Hidden Halls of Hazakor”. As a matter of full disclosure, I have worked with Jackie as an illustrator for most of our recent Bedrock Games books. BRENDAN: What is “The Hidden Halls of Hazakor”? SCOTT:“The Hidden Halls of Hazakor” is a starter adventure for fifth edition Dungeons & Dragons. It’s a straight-up, old-style dungeon crawl (and a bit of a love letter from me to “Keep on the Borderlands” and “In Search of the Unknown”, the original D&D starter adventures in which a lot of old-school gamers first played). But in addition to being written for beginning Dungeon Masters (as most starter adventures are), it’s also written specifically for young Dungeon Masters — players anywhere from 12 years old and up who are just getting into the process of running their own games. JACKIE: It's absolutely something I would of liked as a kid. I was very lucky to have a group of older, more experienced people to help me play but I know a lot of teens now who want to begin a game with their friends and don't know how. BRENDAN: What are some of the issues you found beginning Gamemasters grapple with? What were both of your experiences when you first tried your hand at it? SCOTT: As everyone who does it knows, running a roleplaying game well is more of an art than a science. And for better or worse, that means that a lot of what you need to know to be a good Gamemaster comes from the experience of running games. The tricks and tools are things you often pick up only by trial and error—but when you’re a young player trying to run a game for the first time, there’s only so much trial and error you can take before things get frustrating. I first got into RPGs in high school, and even at sixteen, running my first D&D games was a remarkably stressful experience. You need to be on point with rules decisions, even as you’re trying to be creative and improvisational at the same time. You need to constantly try to reach the “Goldilocks” level for your encounters (not too hard; not too easy). And then you add into that the overarching idea that you’re the person responsible for making sure all the other people around your table are having fun. It raises the stakes of running a game to a whole other level. JACKIE: My first game was probably not so great to play in, ha ha. I had written out way too much, and thought the players would act a certain way or perform a task just as I imagined it. I couldn't have been more wrong! I always find that as a storyteller or Gamemaster, you have to be ready to roll with all the funny things you'd never expect someone to do. My friends were all such great sports though. I think the most crucial take away I had from my initial experiences was to make it fun - that's the most important aspect. BRENDAN: Where did the idea come from? SCOTT: The concept of doing a starter D&D adventure for young DMs came as a result of running an afternoon RPG club at my daughters’ middle school a number of years ago. We had a great turnout and a good mix of experienced Gamemasters and players wanting to run games for the first time. And for that latter group, I found myself kind of floating around the room answering a lot of the same questions, and giving the same advice, and seeing GMs dealing with the exact same problems I had dealt with running my first games. But they all had the added complication that when you’re eleven or twelve years old, it’s often hard to summon up the confidence to bluff your way through not knowing what you’re doing—as all experienced GMs eventually figure out. BRENDAN: How did you approach designing the Halls of Hazakor? SCOTT: The main issue that came up in the design process was trying to balance the desire to have the adventure be easy to run, and the desire to not have it be simplified to the point where it took the edge off the fun. Though the final version is still written in the same straightforward style as its original RPG club incarnation, at the end of the day, I think this is still a fun little dungeon crawl that any group of players would enjoy. Beyond that, the biggest design paradigm involved embracing a sense of adventure-as-instructional-piece. I was always looking for ways to not just tell the DM what was going on, but to give a sense of how what was going on related to the larger issues of what it means to be a DM. So for most of the encounters, it’s not just a matter of creating an interesting scenario. There’s a goal of wrapping up some little idea that'll crop up time after time in every adventure the DM will ever run. Little things like: If the characters run, should the monsters chase them? What do you do if those monsters chase the group into a bunch of other monsters and the encounter suddenly gets too hard? Is it fun to terrify the players by asking them to make Wisdom (Perception) checks even when there are no monsters around? (Answer: Yes, it is.) And then on top of the little things, there are the big issues that every first-time GM wrestles with. How do you help the players work through arguments? How do you deal with problem players? And how do you deal with characters dying? BRENDAN: What was the art process like? JACKIE: So, a little story time here: roleplaying games are what made me decide I wanted to make my career as an illustrator. 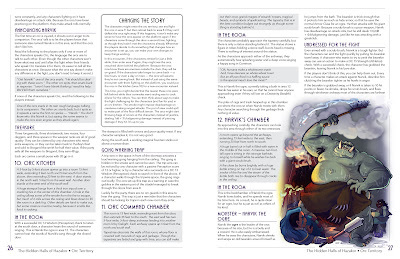 The first time I was handed a player's guide and opened to see the art inside, my brain just exploded. It was so cool, and so amazing-all the styles, the characters... that's what I wanted to make. Playing the games gave me the opportunity to begin that when my friends would describe their characters and I would draw them-and the stories and ideas we came up with seemed so alive and creative. It's absolutely why I'm doing what I do now-I want to pay it forward. I want to see more characters in these amazing books that call to who I am, and call to the multitudes of folks who might want to play a game. I hope as many people as possible can look at these characters and see themselves enough to become invested and inspired. So, when Scott initially approached me and stressed how important having a diverse cast of kids as the main characters, I was totally on board. SCOTT: The only real vision I had for the art was that I wanted a style that would be a good fit for younger players, and that it would be cool to have one illustrator do the whole book (which isn’t the normal process for RPG stuff). And I consider myself extraordinarily lucky that Jackie agreed to come on board. We talked about having a set of young iconic characters kind of anchoring the illustrations, to give young players a sense of connection to them, and the crew that Jackie came up with are absolutely awesome. Out of everyone that's backed the project and all the people that have offered feedback, literally every single person has commented on how much they love the art. JACKIE: I am so thrilled about the reception it's got. 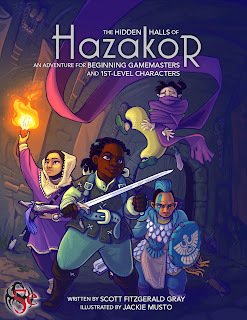 I really love those kids and want to see them tackle the Halls of Hazakor. BRENDAN: Can you talk about the Eternal Hero! Rewards? SCOTT: Only in a “Sorry, they’re all gone!” way, unfortunately. 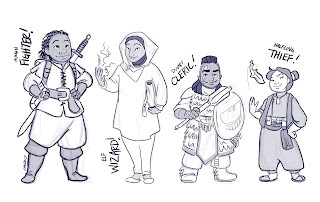 Jackie came up with the idea of offering a limited number of player portrait packages, so that backers could have their daughter, son, niece, nephew, et al immortalized in heroic RPG style. And they went amazingly fast. JACKIE: I can thank younger me for that one. I always wanted to be a character in the books we were using, so I figured other kids might like to see themselves as well! With the Eternal Hero reward, kids will see themselves turned into an actual hero that could be undertaking the Halls of Hazakor. Supplied with some reference, a favorite class and color I'll be drawing an original, custom drawing of the child at this tier. And I can't believe how fast those reward tiers went! I thought ten would be enough-I wish I could do more! BRENDAN: What are some of the changes and trends you’ve seen in recent years in terms of new Gamemasters coming to the hobby? What impact has technology had? JACKIE: It's become so much more mainstream, which I adore. I think roleplaying had kind of a strange mystery about it that folks didn't always understand-but there have been a lot of podcasts and YouTubers who have demystified it and brought it to a whole new audience. The internet also makes it easier to connect and play with friends. My current group uses Discord and video chat to get together, share maps and other important details. It takes the difficulty of finding local players and makes it so much easier. There are also so many games that I think there is something the appeals to everyone no matter if you're a history nut, high fantasy person or into the social manipulation type game-there is something out there for you. SCOTT: I think the single biggest trend I can point to is the popularity of fifth edition D&D. That revised ruleset has introduced the game to a new generation of players who were never exposed to the previous editions of D&D—and at the same time, it’s brought a lot of older players back into the game. People who (like myself) played AD&D in high school or college before getting busy with life in later years have embraced the new game in an amazing way. That’s definitely a testament to the work that the design team put in on fifth edition, and their specific goal of bringing back some of the feel of the older versions of D&D where that had gotten lost over the years. But the practical upshot is that the current D&D player base covers probably a wider range of age and experience than it ever has before, largely because of how accessible the rules are and how easy it is to get into the game. Technology has had a solid impact on tabletop gaming, at just about every level. Fifth edition D&D is a solid ruleset partly because of the multiyear process of the D&D Next playtest that preceded it, which saw multiple iterations of the rules released online for playtesting by the entire D&D community. 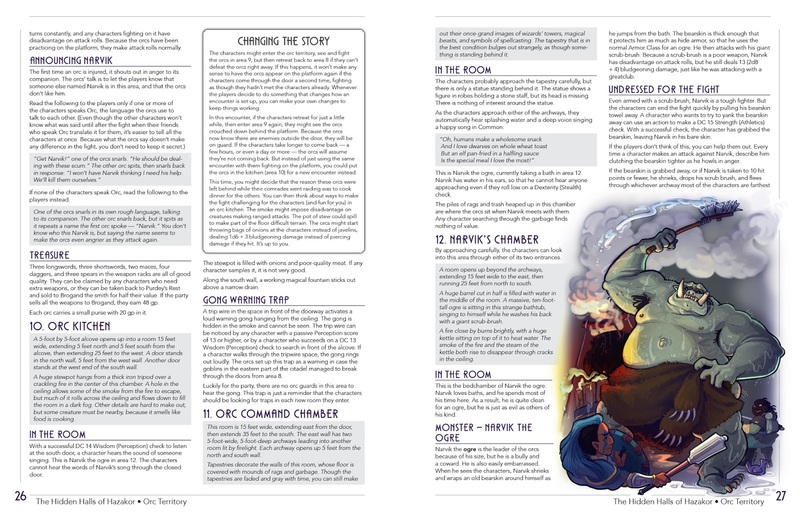 Though the Web has obviously been around for a while, that kind of release-the-rules/collate-feedback/revise-and-release-again approach to creating a game of D&D’s scope is something that I don’t think could have been done even ten years ago. And pretty much every RPG these days is making full use of the Web to build and support their own communities of players. Game books that I owned in high school and gave away years ago are all available as PDFs these days. You can try out D&D and a lot of other games using inexpensive (or sometimes even free) basic and fast-start rules published as PDFs. You can go onto YouTube or Twitch and watch people playing D&D, Pathfinder, Fantasy AGE, Shadow of the Demon Lord, and every other game imaginable. You can use virtual tabletop software and video chat to connect with other players online as easily as you can around a table. I, myself, run a weekly game on the virtual tabletop website Roll20 that involves players scattered across three time zones—including two of the friends from high school who I started gaming with. From a players’ perspective, the proliferation of electronic tools and resources for RPGs these days is something that would literally have blown my sixteen-year-old self’s mind. BRENDAN: What are some of the things you are most excited about for this project? JACKIE: The excitement for me is turning more kids onto the creative aspects of making a world, a story and characters. There is something about bonding over a story that you developed with other people that is unlike any other creative endeavor that you can do. It's a magical experience and if we can make it a more welcoming and inclusive experience for any kid, I'll feel like we've done our job. SCOTT: I’m always generally excited when people play RPGs; and I’m specifically excited when young players get into tabletop games. I do a lot of work in D&D, and I play Pathfinder on the side, and I read as many of the new games coming out as I can, even when I know I’ll never have time to play them. It’s very easy to say that this is the golden age of roleplaying games, and I personally don’t see any sign that that age needs to end anytime soon. And on a more specific note, one of the most positive things about tabletop RPGs becoming ever more popular and widespread is that those games are seeing a much more diverse range of players embracing them—and the games themselves are embracing that diversity in turn. I was a very small part of the team that created D&D fifth edition, but one of the best things about working on that game was seeing the conscious effort that Wizards of the Coast made to break away from the traditional male-centric, Medieval European fantasy tropes that have been central to so many fantasy games over the years. Virtually all of the most popular RPGs have taken this same approach (and in some cases, predating and inspiring Wizards’ decision to do so). And though “The Hidden Halls of Hazakor” is a pretty small project measured against the breadth and scope of all things D&D right now, one of the things I really wanted it to do with it was reinforce this idea that gaming is for everyone — both in terms of the writing goal of wanting to create something that would help young players get the most out of the game, and in terms of seeing Jackie’s art reflect a version of how I think RPGs should look. The conversation about diversity in games is long overdue, in my opinion, and in whatever small way I can help steer that conversation, I’d like to do so.